Discussions that took place this night (3) ended in a fiasco after the debate which took place between President Maithripala Sirisena and representatives of United National Front because he refused to appoint Ranil Wickramasingha as the Prime Minister. The President said "not 122 but even if it happens to be 225, I cannot do it!". court decision and that he would be forwarding an appeal tomorrow. In the process, a media discussion by former government party has taken place. 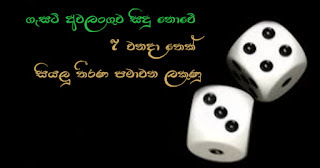 A question was posed to member of parliament Susil Premajayanth by the media whether a Prime Minister would be appointed by the UNP. Susil's response to the question actually was hidden in the reply the President was to give a few hours after that. What he in fact said was that former Prime Minister Mahinda has had a discussion with President and that Mahinda's letter was written after the said discussion. Susil further said that President would his legal advisors and then give a decision. It ca be suspected that the point would have been the basis of the special discussion between President and Basil. It may further be assumed that even if some other was nominated other than Ranil, the President has ideas of delaying the next court case till 7th without giving the designation of Prime Minister to the UNP. Before the Supreme Court inquiry begins on the 4th regarding President dissolving parliament, this rumour of President withdrawing it this news was broadcast across foreign media some days back. However, he had said that he he had later changed the decision as exposed to United National Front in the discussions. Political sources have reported that legal advice has been given that what has influence this decision is that even if the President was to withdraw it or not, as the gazette has already been released, the possibility of challenging it is equally prevalent. Certain clues were hinted at the United National Front discussions today about the Prime Minister and the cabinet would be named by him inclusive of ministerial portfolios and it was reported that Finance, Highway and Ports could not be handed to any other and would be kept under his possession. What Sajith Premadasa said recently was that he does not consider himself as an alternative to Ranil. Whatever it is, this dialogue of not making Ranil the Prime Minister took a heated situation with discussions coming to nought with no Prime Minister being not named for the country. By now, according to the constitution it is the President who commands activities of all ministerial posts and of the Prime Minister. This then is the very first instance in the history of politics of Sri Lanka that a situation of this nature has dawned. As such, it is presently apparent that the President is making an effort to delay all decisions till 7th with the anticipation of dissolving parliament.